Hurricane Irene battered the east coast of the US all weekend long, as it went from a category 2 hurricane to a cat 1, and then, simply, a tropical storm. 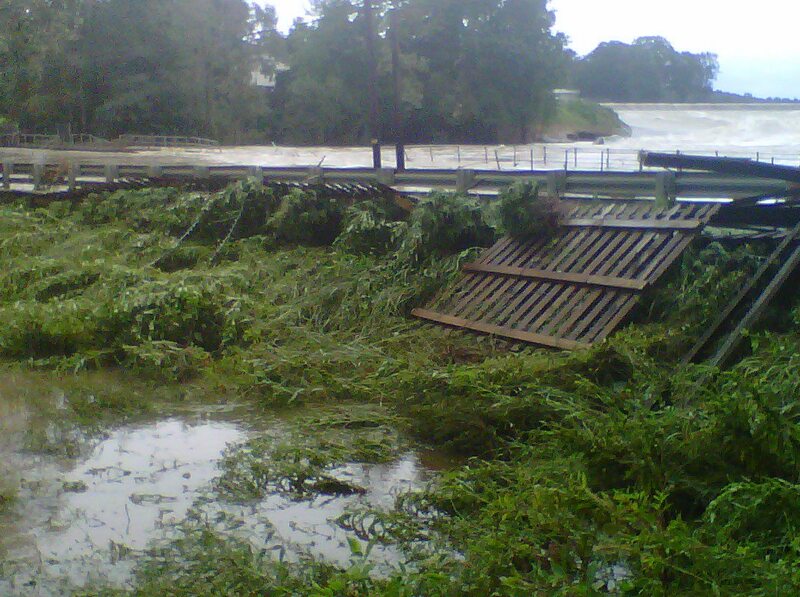 With a series of mandatory evacuations in place across several counties and States in Irene’s path, all reasonable efforts were made by authorities to keep people safe. Property was a different issue entirely, as it can be replaced. But you might have a hard time convincing Sebastian Bach of that right now, as the rocker lost his New jersey home to the storm. "I am numb, in shock and devastated to report that my home of 21 years, my house featured on MTV 'Cribs', has been destroyed, condemned and deemed uninhabitable due to the extreme flooding courtesy of Hurricane Irene. "In the two decades I have lived in this home, there has never been a single drop of water in the basement or anywhere else in the structure. 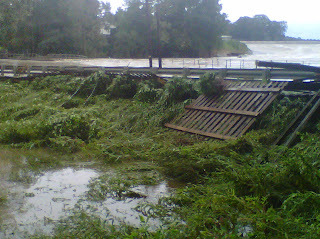 Now Irene has overflowed the reservoir adjacent to my house. The surging waters have snapped the bridge in half next to my house (see photo above) and sent the bridge straight into my garage, knocking the house off of its foundation. The basement that has been dry for over two decades is now overflowing with water and I am not even allowed to start pumping the water out due to fears of electrocution. "Original Skid Row and KISS fans, I have bad news for you. Gone are irreplaceable items, such as my KISS Gargoyles from the 1979 tour. KISS pinball machine. Skid Row master tapes, video and audio, concerts, master tapes from 'Oh Say Can You Scream', etc. Boxes and boxes of one-of-a-kind Skid Row memorabilia, from the first tour to our last, all stuff I collected on the road that no one else had. I had a library in the basement with every single magazine that had Skid Row on the cover. This library took up a big part of the basement. All of this is lost now. "We will salvage what we can, of course. But how I wish there was a reason to do a box set or something before Hurricane Irene hit. Nobody cared. Now it's too late. "Don't know what you got till it's gone, indeed. "The good news is that all my father's artwork, including the 16-foot 'Slave To The Grind' mural, is all OK. My sons and friends moved all my dad's art to the second level of the structure before Irene destroyed our home. My Silver Age comic collection is all on the third level, with the David Bierk archives, which is a completely dry level. But we are not allowed into the house yet to retrieve everything because the foundation has crumbled and the house could conceivably collapse at any second. We are working with the police and fire department to get the electricity turned off so no one gets electrocuted entering the premises. As soon as the power is off, we will pump out the basement and salvage what we can. Everything will be put into storage and then it looks like we will level the house. "This has really taught me that the best things in life are indeed 'free.' What makes me happy is that my children and ex-wife are safe. My dad's art is unharmed. No one got hurt. My scrapbooks of memories of my life are dry and safe. The only things that are making me smile today is cranking Black Veil Brides' 'Set The World On Fire' CD over and over again. Texting Danny from Asking Alexandria who may become my new roommate in L.A. Getting texts from my girl Minnie [Gupta] in L.A. making sure I'm OK and trying to cheer me up. My neighbours in New Jersey clamoring around my house, calling me, offering help in any way they can. These things mean more to me than mere possessions. "I have been holding on to my house since December, when my divorce papers were filed. I just could not let go of the only home I had ever known. Well, God has other plans for me it seems. He has made His decision for me. My home has been taken away by an 'act of God.' I just think He is giving me a much-needed push, is all. "New Jersey, thank you all so much for 25 years of rock 'n' roll. It's all over now. I will always love New Jersey, but now there is literally nothing left for me here except memories of a past life. "Hello, Los Angeles. Hello, New Life. Here i am. It's time for a new start. Like I have a choice."